Located in the heart of Dunedin, the Wains Hotel Dunedin is housed in a beautifully renovated and elegant Victorian-era building. The hotel’s cafe-style restaurant ‘Relish’ is open daily and offers regional cuisine. Free unlimited WiFi is provided. 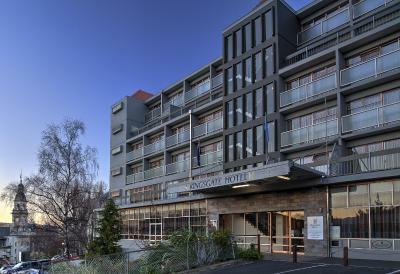 Centrally located in Dunedin, the Kingsgate Hotel is a 3.5 star property offering spacious accommodation close to the city centre and next to the Fortune Theatre. Guests receive 30 minutes' of free Wi-Fi per day in the lobby and bar area. Mercure Dunedin Leisure Lodge is a 4-star hotel set in landscaped gardens overlooking Dunedin’s Botanic Gardens. The hotel is a 5-minute drive from the city centre. 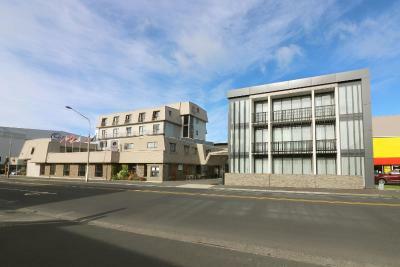 Scenic Hotel Dunedin City is a 4.5-star hotel which offers modern accommodation, many with harbour views. The hotel is located only 2 blocks from the Octagon, the city's famous landmark. Guests enjoy free WiFi. Built in 1883, the unique Scenic Hotel Southern Cross is situated in the heart of Dunedin. Just a short walk from the train station, it offers historical charm and a well-equipped fitness centre. Guests enjoy free WiFi. Aurora on George, formerly Cargill's Hotel, has been completely refurbished and offers a stylish 4 star rated motel, situated around a beautiful centre piece garden. Free on-site parking is available. Hotel St Clair is located just 10 minutes’ drive from central Dunedin. Rooms include flat-screen satellite TV, en suite bathroom with under-floor heating and views of St Clair Beach. A 5-minute walk from Dunedin’s city centre, Leviathan Hotel offers a restaurant and a bar. All rooms are fitted with modern furnishings, a TV and tea/coffee making facilities. Cadbury World is 400 metres away. Centrally located in Dunedin, Victoria Hotel is a 5-minute walk to The Octagon and St. Paul’s Cathedral. It offers spacious studios and apartments with satellite TV and private balconies. There are 2 on-site restaurants.